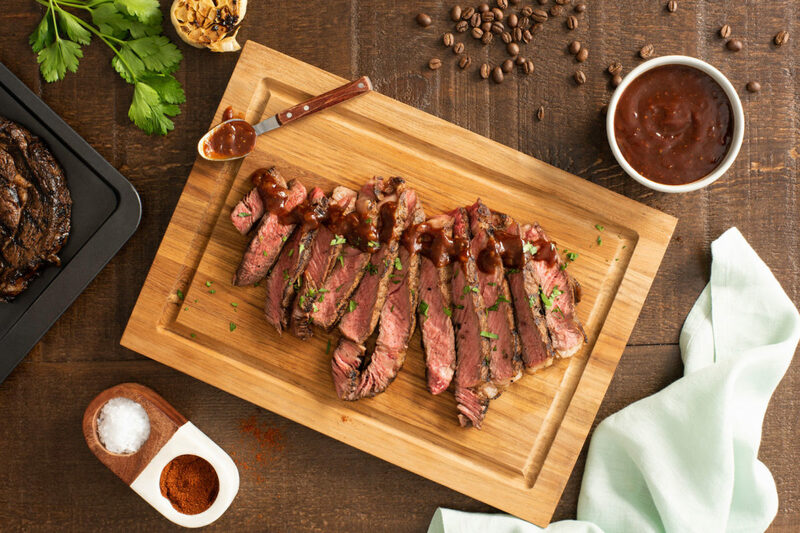 Served with a quick and easy barbecue sauce, these cowboy-inspired grilled steaks deliver big bold Tex-Mex flavors. Preheat grill to medium-high heat; grease grate well. Stir together 4 tsp beef base, oil, chipotle powder, ground espresso, pepper, 1 tbsp brown sugar, cumin and garlic; set aside 1 tbsp spice mixture for barbecue sauce. Rub steaks all over with spice mixture. Let stand for 15 minutes. Meanwhile, melt butter in skillet set over medium heat; cook remaining beef base, reserved spice mixture, onions and garlic for 3 to 5 minutes or until onions are softened. Stir in ketchup, remaining brown sugar, vinegar, tomato paste, mustard and hot sauce; bring to boil. Cook, stirring often, for 3 to 5 minutes until thickened. Transfer to serving dish. Grill steak, turning once, for 6 to 8 minutes per side for medium-rare or until desired doneness. Let stand for 10 minutes; serve as steaks or sliced off the bone. Serve with sauce.